In what seemed out-of-left field, when I logged onto the Twitter website early this morning, I was greeted with a notification of new list functionality being introduced in beta. This is, of course, incredibly awesome, and something we’ve all been begging for for over a year, but I hadn’t even heard murmurs about them seriously working on this functionality, so this came like manna from heaven. 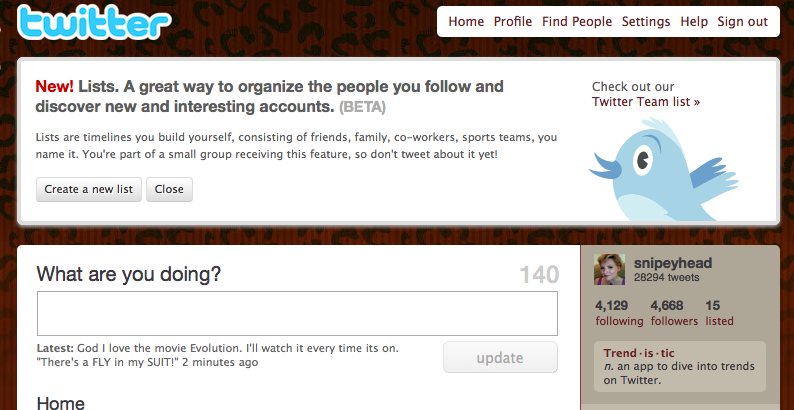 Notice that the beta message specifically asks that you don’t tweet about it, since invites are selective right now. Oops. Unfortunately, I was so excited about seeing list functionality, I took a screenshot and twitpic’d it and tweeted about it before I even read the whole message. So that’s my bad. Ironically, as far as I know, Twitter has still not fixed the bug where deleted tweets still show up in search, so due to their own issues, I couldn’t even take it back after the cat was out of the bag. So, to Twitter I say “Sorry dude. My bad.” I also find it hard to believe that they would expect people not to tweet about this, considering its probably the single-most significant change in Twitter since they broke @replies. That said, if they had notified me properly, I would have actually kept my yap shut. If this was a test Twitter was putting me through to see if I was trustworthy enough to keep my mouth shut, I clearly failed. On the other hand, they should have made the “please don’t tweet this” text a little more prominent, or sent the beta invitees an email or DM explaining the conditions. Twitter is, by their own self-imposed definition, the epitome of the short-attention-span theater that represents people on the internet today, so part of me wonders if there was a little reverse psychology action going on, counting on the buzz that would be created by people not honoring their vow of silence. Hopefully we’ll soon see a wave up updates to our favorite Twitter clients, including the ability to sync existing groups from apps like Tweetdeck into the new list functionality on Twitter, saving Tweetdeck users the hassle of having to re-categorize all of their followers all over again. 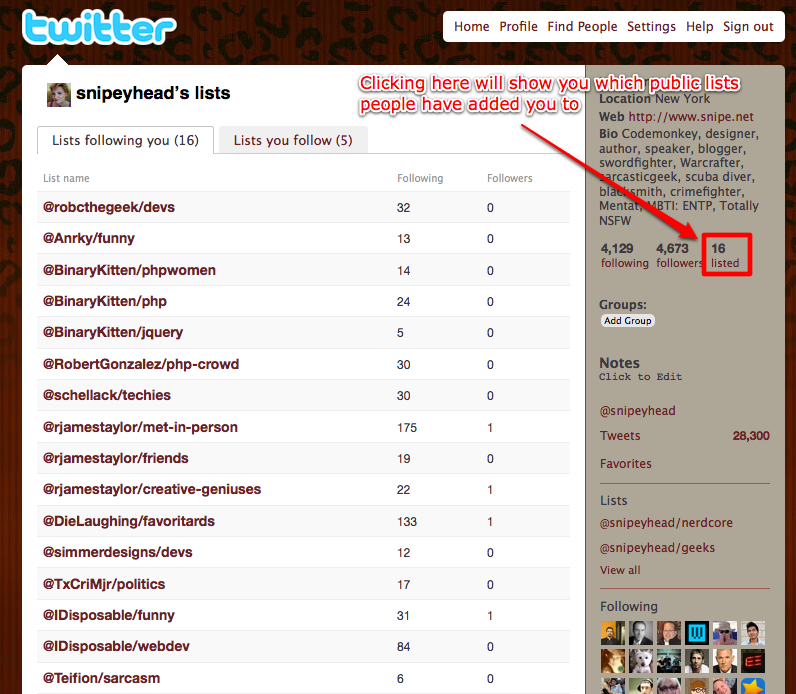 IMPORTANT NOTE: When you add someone to a public list on Twitter, that user – and everyone else – can see to what lists you’ve added them. 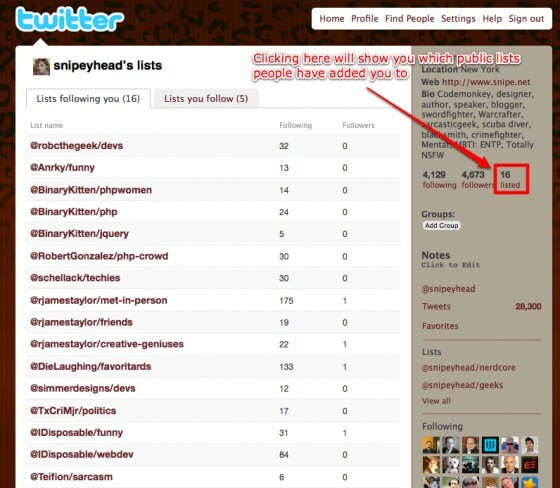 Clicking on the ‘lists’ link will show you the names of the people who have added you to one of their lists, and which lists they’ve added you to. So, keep that in mind as you’re classifying and categorizing the people you follow. You’re obviously welcome to add people to lists like “douchebags”, “asshats”, and “morons I work with”, but don’t come crying to me when they call you on it. You were warned. I have NO idea what their criteria was for picking people to include. Could be prolific tweeters, could be completely at random.